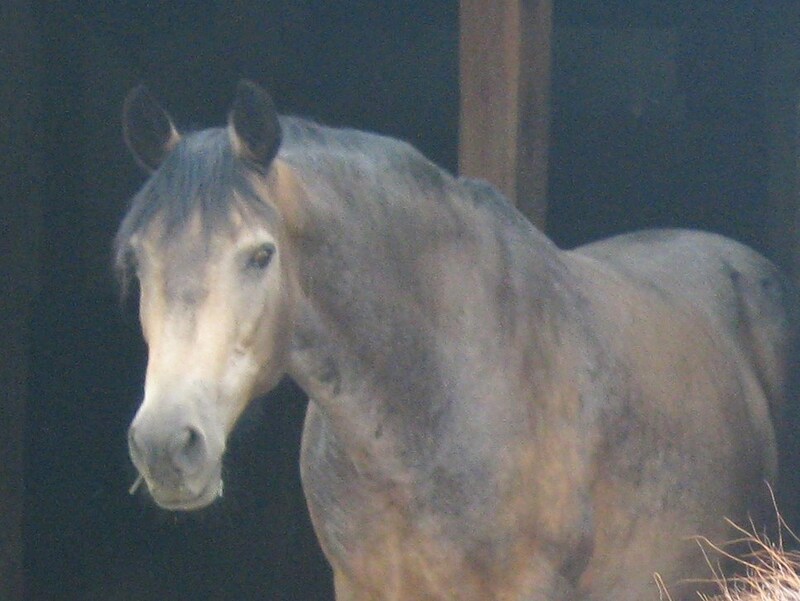 Long ago my husband adopted a magnificent Peruvian Paso gelding named Espiritu del Viento, or Spirit of the Wind. When they first met, Espiritu was a frightened two-year-old, too terrified of people to accept a carrot from a human hand. My husband was nearly as frightened of horses, having suffered several indignities at the hands…er, hooves…of previous equines. However, he shoveled what had to have been tons of manure to earn Espiritu from his owners. The horse and the man learned about riding together—each suffering a few cuts and bruises along the way. Soon they were the kind of friends Winston Churchill referred to when he said, “There is something about the outside of a horse that is good for the inside of a man.” We moved Espiritu and another horse named Callie to a different boarding stable where my husband and I could be their caretakers. My husband and I were inside the stable, shoveling away as usual, when one of the other horse owners came to fetch us. “You have to see this!” she exclaimed. We followed her outside where we had a view looking down on the pasture where several horses were grazing. Espiritu stood at the edge of the group. He had found a piece of wooden board–perhaps a foot long–on the ground. Now he held it in his mouth. We smiled. “Nice trick,” said my husband. Sure enough, Espiritu approached another horse, my mare, from the rear and smacked her smartly across the rear end with the board. She reacted like any schoolgirl being harassed by a naughty boy on the playground, spinning and snorting and tossing her head. She wandered a few feet away and was soon absorbed again with the spring grass. Lest we think the joke had been a fluke, Espiritu repeated it. This time all the horses moved away from him. And we weren’t sure we didn’t hear him chuckling. Espiritu wasn’t afraid to target humans with his humor, either. His favorite move started with sweetness. Espiritu, the horse of a different color that used to range from a roan brown to an effect of being heavily frosted, could feign a soft, appealing look that always enticed whoever was close at hand to begin fondling his face and ears. Espiritu would snuggle closer. The human, thinking he was being adored, would concentrate on the joy of feeling the soft ears. He was rewarded by the cuddly sensation of Espiritu’s head slowly sliding down his chest until Espiritu would finally pull away and the man would discover the horse had untied his shoes. Do horses have a sense of humor? Perhaps that depends on the horse, but we knew at least one who specialized in horsey slapstick. This entry was posted on December 7, 2013 by Personal Journeys with Gramma in Life Stories and tagged Equestrian, featured, Gelding, Horse, Humour, Life Stories, Peruvian Paso, Winston Churchill.